Believe it or not but my kids loved French Onion soup from the time they were about 10 years old. Maybe it was just the little oven proof ceramic crocks with the handle that they liked. Here is a delicious recipes sure everyone will like. Note: I left out the wine and sherry when I cooked this for my kids. Melt the butter with the oil in a large pan over low heat. Add the onions and sugar and coat well. Place the sheet of damp wax paper or parchment paper on top of the onions. Cook uncovered, stirring occasionally for about 30-40 minutes, until the onions are a rich brown color. Be care ful not to burn the onions. Remove the paper and stir in the wine. Cook over medium heat for about 4-5 minutes. Sprinkle on the flour and stir for 2 minutes. Pour in the stock and bring to a boil. With the heat on low, simmer for about 20 minutes, add the sherry and simmer for another 10 minutes. Season to taste with salt and pepper. 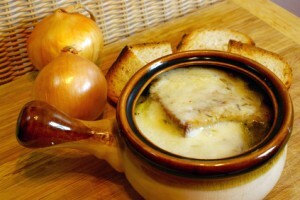 Divide the soup among the crocks, place 1 or 2 pieces of bread on top, then top the bread with the grated cheese. Put under the broiler for about 2 minutes or until the cheese is golden and bubbly. Thank you for commenting on our blog. Are you affiliated with a school?